Djalu’ Gurruwiwi loves to share the story his father passed to him about the Djuŋgirriny’, the deep and powerful Gälpu clan yidaki with the power to stir the west wind Bärra’ and connect people from distant lands. It is a popular notion around the world that Djalu’ is “the custodian of the yidaki” for Yolŋu people, but this is not quite true. As he says in his story below, his father chose him to hold the yidaki knowledge of his clan – the playing of their clan’s songs and the stories of Djuŋgirriny’ and another deep yidaki held by the Gälpu and related groups. He is not the boss of all the yidaki of all the other Yolŋu clans, although because of his keen interest, he does know a good deal about them. Many Yolŋu from the Miwatj and Laynha do respect the Gälpu as owners of powerful yidaki knowledge, but this story can not be shared – only the Djuŋgirriny’ story below can. 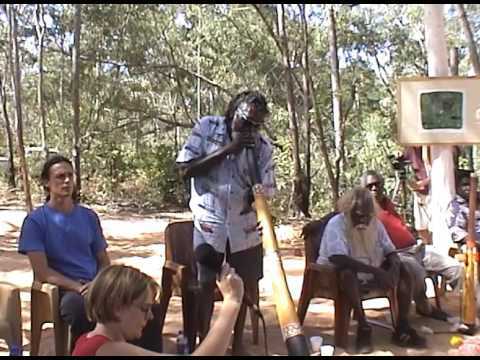 Djalu’ demonstrates the song Bärra’, the west wind, and the sound of the Djuŋgirriny’ at the 2004 Garma Festival Yidaki Forum. Djalu’ called the yidaki shown here the one he always dreams of making. It called to him from the bush as he was hunting for yidaki, and he thought, “Where is that yidaki? I must find it!” As he found it and began to chop, water poured from the hole. The hollow tree had been filled with rainwater, curing the wood from the inside while it was still living. He said it healed him to play this yidaki. It is Djuŋgirriny’, a large and powerful instrument, with medium back pressure. Djalu’ does not prefer small, high back pressure instruments, and thinks that while they are good for the fast and aggressive styles used by young Yolŋu today, they are actually not good for your health. The more clear bore and lower pressure coming back at you helps you to breathe fully and naturally, rather than forcing your breath to play yidaki. This is what his father taught him, and what he credits for his health and ability to play yidaki and hunt at his old age while other old men have quit playing long ago and stay home. This Djuŋgirriny’ is bigger and deeper than the one we’ve seen before, which is also used by Djalu’ in the video above. It is 174cm long, with a 38mm mouthpiece and a 13.5cm bell. It is in the key of D with an E horn tone, and requires great power but a refined and subtle lip to play. The tone is very warm and bassy, while still having great clarity in the higher frequencies. D is a deep key for modern Yolŋu yidaki, whereas the other Djuŋgirriny’ we’ve seen is in the higher key of E. They do share the large size, open bore, warm powerful sound with balanced high harmonics, soft, full horn tones, and midlevel back pressure. This combination of sound, size and playability makes up what Djalu’ defines as the perfect Djuŋgirriny’ and the perfect yidaki to play for your health. Listen as Djalu’ plays Bärra’ on this yidaki, either via the streaming audio or video clip, then you can hear the song played on a different yidaki in context with voice and clapsticks in an excerpt from the CD Gawurr Manikay. 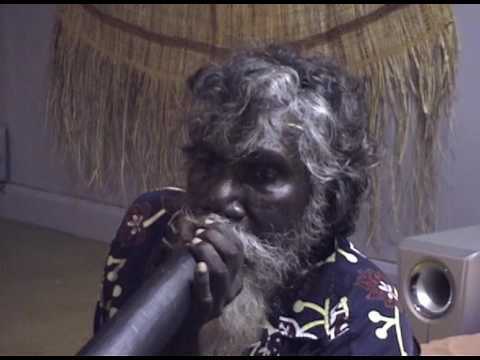 This is how Djalu’ told the story at Garma in 2002, speaking in his own Gälpu language. The lists of place names are normal for Yolŋu storytelling and singing, and are an important part of stressing connections between land and people. He refers to the original Djuŋgirriny’, still at a sacred site with the Maung people of Goulburn Island, off the north coast of western Arnhem Land. A part of this story is also told in the song Bärra’, sung above by Djalu’s late brother Gurritjiri. This story is about the yidaki, at the places called Ŋaypinya, Gurruwurru, Winirriŋ, Yunawalthamana, Dhararrarra, and Yirrkay. From those riŋgitj places (places ceremonially shared by clans). Ga banhayam yidakim… yidakim nhan banhaya nhan dhupal märrma’ – Marrakulu ga Gälpu. Yidaki-waŋan dhupal Marrakuluyu, ga nhanam mä nhangu malikinan yaka nhan wata-wulan. And that yidaki… there were two yidaki – Marrakulu and Gälpu. Those two clans played the yidaki, and when the Marrakulu played, it was weak and the sound didn’t carry. Banhaya nhan Djuŋgirriny’ŋa ŋayim. Djuŋgirriny’ŋa. Ŋunha Gurruwurru’ŋa. Ga Djuŋgurriny’ŋa ga Manhdharrŋa, ga Ŋaypinyan. Manymak? That happened there at Djuŋgirriny’. Djuŋgirriny’, Gurruwurru, Manhdharr, Ŋaypinya. Okay? Banhayam yidakim, banhayam Djuŋgirriny’ nyäku. Yidaki-waŋanham bala nhan malikuyinan lupthuwanan dupthuwanam nhan ga dhurrwaraŋa Manhdharrŋa dhal’yuwan. That particular yidaki called Djuŋgirriny’ is mine. The Marrakulu yidaki sounded, but then went bad, and sank in the water. The sound threw itself it into the river mouth at Manhdharr. Dit’thuŋ-dhuwanam nhanam miwukthuwanan wata Bärra’. Bärra’. Yalyal miwukthuwan bala liyuwan Gurruwurru. Gälmak against nhan banha liyuwanan Gälmak. “Yäw, manymaktjinan,” bandakwulanynha liyuwanam Matjindji. Liyuwanam. The yidaki sounded, then the wind Bärra’ stirred. Bärra’. This soft wind stirred, then reached Gurruwurru. It reached Gälmak (home of Wititj the olive python). “Hey, that’s good.” It hit the Bandakwulanynha and Matjindji (sacred Gälpu sculpture and dilly bag). Hit and resonated it. Ga balam nhan rirrakaynha naŋ’thuwan Gomumuk. Gomumuklin. Ga Mirarrmina. Ga Gurwana, Many’punurru, Yapayapa. Yow, banhayam part nyäkuway, ŋunha Djuŋgirriny’, Goulburn ŋoya yaka, dhunupa. Ŋunhaya walŋa badak ŋunha. Badak ŋunhaya. Yes, that one yidaki is mine, the Djuŋgirriny’. It is lying there at Goulburn, straight. It’s still alive there. Still there. A yiḏaki made by Mithinarri Gurruwiwi and used in ceremony in the 1960's, identified by Mithinarri's son Watjuku and Djalu' as a Goulburn style Djuŋgirriny'. Ŋarru nhunu bayiŋ bitja ŋunha nhunu bayiŋ ma wakin wekaŋ rrupiya yolŋuyu. Ŋunhaya nhan ŋoya yaka. Banhayam Gälpu’wu yidaki ŋunhayam ŋurruŋu. Manymak. Bala dith’dhuŋ-dhuwanan yakan ŋaya. Ŋanapiliŋgu ŋalapalmi, djinaŋ wala ŋanapu yaka dith’dhuŋdhun. Bala miwukthun yalyal. There it lies. That first yidaki belonging to Gälpu. Okay. And I am still playing yidaki that way – ḏith’dhuŋ. Nowadays we play ḏith’dhuŋ on the yidaki the same like our ancestors. Then the soft wind rises. Ŋunha dit’thuŋdhun yaka, ŋupanŋarruŋ ŋunha aah ŋunha bayma. Mayŋupa, Gurralpa, Djinbiditnhaŋunha bayma. Winirri, Yunawalthamana, Mätjitjpa, Gulukurru, Yirrkawuy. Sacred ŋunhayam ŋayi. Yuwalk! When the yidaki sounds, it wanders around there. There at Mayŋupa, Gurralpa, Djinbiditnha. And there at Ŋawaṯ’ŋawaṯ. Bärra’, the west wind. Here at Ŋaypinya, Gayarrara, Winirri, Yunawalthamana, Mätjitjpa, Gulukurru, Yirrkawuy. Those are sacred places. It’s true! Badak ŋunha. Yaka ŋarru nhan entering. Ŋarru Mandawuy ga Galarrwuyyu dhupal yaka ŋayathan. Djuŋgaya.